This gut-wrenching abdominal pain, accompanied by cramping, bloating, and diarrhea or constipation, doesn’t just make you feel miserable. It can create serious problems in your life, forcing you to stay home from work and say no to anything that means you’d be too far from a bathroom. An estimated one in six Americans—and twice as many women as men—has irritable bowel syndrome (IBS). “The muscles in your colon that squeeze to push stool through malfunction,” says Philip Schoenfeld, MD, associate professor of medicine at the University of Michigan School of Medicine. The muscles either contract too quickly, giving you diarrhea (IBS-D), or too slowly, so you’re constipated (IBS-C). People may develop IBS after a GI illness, a course of antibiotics, or emotional trauma, says Christine L. Frissora, MD, associate professor of gastroenterology at Weill Cornell Medical Center. When people with IBS supplemented conventional treatments with acupuncture, 49% got relief for up to a year from symptoms like pain, constipation, and diarrhea, according to a 2012 study. “We found that acupuncture is an effective IBS treatment when used as a supplement to more traditional therapies,” says study author Hugh MacPherson, PhD, senior research fellow in the department of health sciences at the University of York in the UK. IBS may be caused by an overgrowth of bacteria in your colon or small intestine, or certain types of bacteria living in your gut may produce symptoms. Because of this, researchers are now investigating antibiotic treatments. In a 2011 study at Cedars-Sinai Medical Center in Los Angeles, 40% of patients who took 550 mg of the antibiotic rifaximin three times a day for 2 weeks felt significant relief from bloating, abdominal pain, and watery stools for up to 10 weeks after they stopped taking the drug. “Many doctors prescribe rifaximin off-label for IBS-D if other treatments fail,” Dr. Schoenfeld says. You may know these gut-friendly bacteria best from yogurt commercials, but most of the research to date on probiotics and IBS has focused on supplements rather than food. “Trials have found several products that can alleviate some symptoms, such as constipation, probably by helping regulate the balance of bacteria in your gut,” says Prevention advisor Tieraona Low Dog, MD, clinical associate professor of medicine at the University of Arizona and author of Life Is Your Best Medicine. She recommends one capsule daily of a clinically studied probiotic such as Align, Ganeden Digestive Advantage, or VSL3. 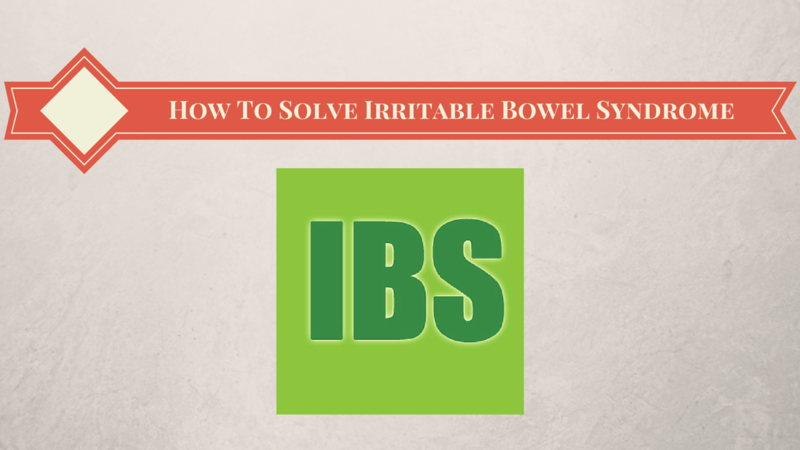 Caffeine, soda, beer, high fructose corn syrup, artificial sweeteners, processed snacks such as chips and crackers, and cruciferous vegetables (think broccoli, cabbage, and cauliflower) can all aggravate IBS symptoms. “Sometimes your body just can’t process them, and that causes nausea, bloating, and cramping,” says Dr. Frissora. She suggests eating foods that are easier to digest: egg whites, fish, pureed vegetable soups, and oatmeal with berries, for example. Lactose intolerance is often misdiagnosed as IBS, so you can also try cutting out all dairy for 2 weeks and see if your symptoms improve. Everyday upsets, turmoil, and irritations don’t actually cause IBS, but if you already have the condition, these stresses can frequently make it worse, says Dr. Schoenfeld. Since there are so many neural connections between your gut and your brain, feeling psychologically or emotionally tense can stimulate colon spasms. Small wonder that many traditional techniques for coping with stress—relaxation therapy, mindfulness training, and cognitive behavioral therapy, to name just a few—have been shown to help lessen IBS symptoms too, according to Dr. Frissora. A bike ride or jog could reduce your IBS symptoms as much as it does your waistline, since aerobic activity decreases stress, makes the colon muscles work better, and helps move gas through the GI tract faster. That’s why when IBS patients in a 2011 Swedish study increased their regular exercise to between 20 and 60 minutes three to five times a week, their pain decreased significantly. For mild IBS cases, OTC treatments can provide some relief, says Dr. Schoenfeld. If you get constipation, take 1 tablespoon a day (more than that can cause bloating) of a fiber supplement such as Metamucil or Citrucel mixed with 8 ounces of water. For diarrhea, try Imodium, which slows muscle squeezing in the colon. “However, if the fiber doesn’t help after 4 weeks or you have to use Imodium two or three times a week for more than 8 weeks, you should see a doctor,” he says. Two of the most effective medications doctors have found for IBS are tricyclic antidepressants and selective serotonin reuptake inhibitors—but not because IBS is caused by depression. Serotonin, a neurotransmitter that affects mood, also plays an important role in digestion—in fact, about 80% of the serotonin in your body is located in your gut. Different antidepressants affect the bowels in different ways, Dr. Frissora warns, so it’s important to match your symptoms with the right prescription. If you have IBS-D, a low dose of a tricyclic (such as Norpramin) may help. If you have IBS-C, an SSRI like Celexa is a better bet. Possible side effects include weight gain and sexual dysfunction.